There are some great international and vegetarian restaurants in San Gil and Barichara. Both a short bus ride away from La Pacha. San Gil is the central hub of the region Guanenta and from the "Terminalito" bus station you can get to all the local colonial style villages like Pinchote, Paramo, Valle de San Jose and some are even within hiking distance from the hostel (Barichara, Cabrera, Villa Nueva, Curiti). All are beautifully built in mud (tapia pisada). 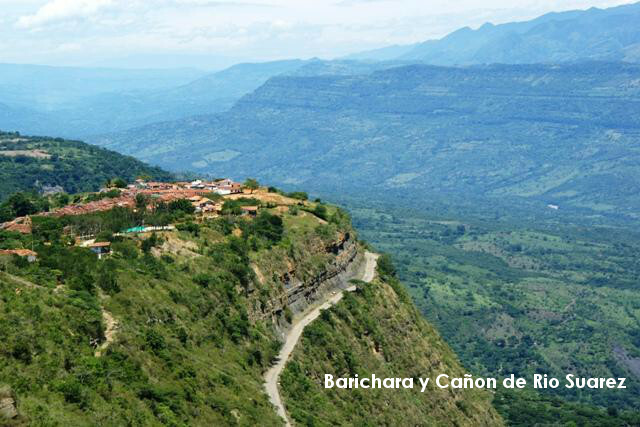 Barichara is a world heritage sight and a must visit for it’s faithfulness to the colonial style and impressive views. The Juan Curi Waterfalls are pretty spectacular and you can swim right under them, which is most refreshing after the 30 min hike up there. To get there take the Charala bus from San Gil “Terminalito” . The bus ride is about 40 mins. There is an entrance fee of $7000. Pescaderito, near the village of Curiti, is a rocky river with loads of different bathing spots. There are pools for high diving and little rapids for tubing. With a couple of restaurants down the bottom it can get crowded at weekends and holidays, but is deserted during the week. It's our favourite place in the area. Barichara is a must visit. You can walk there over the mountain in 3-4 hours or take a bus (20 mins). It's a world heritage sight and often called "The most beautiful village in Colombia". We strongly reccommend the 2-hour hike to the little village of Guane, which goes gently downhill into the Suarez Canyon. Guane has a wonderful museum, beautiful cemetary and interesting local drinks, Chicha and Sabajon. You can take a bus back to Barichara (last from Guane 6.30pm, Barichara 7pm) and stay on the bus to La Pacha and San Gil.